Laurel Electronics, Inc. designs and manufactures electronic instruments for industrial measuement, control and networking. 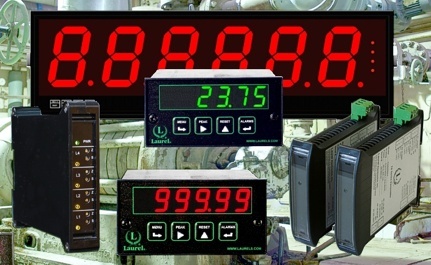 Laureate digital panel meters offer high speed and 5-digit accuracy, plus hardware options and programmable features to solve complex industrial measurement and control problems at minimum cost. Laureate meter options (all isolated) include contact or solid state relays, an analog output, and serial communications (Ethernet, USB, RS485, RS232). The Modbus protocol is fully supported. The QLS Quad Output Loop Splitter sources up to four independently adjustable 4-20 mA current outputs from a single 4-20 mA, 1-5V, 0-5V or 0-10V input. The inputs and outputs can have the same or different grounds. The L40 low-cost universal meter offers 65 user-selectable singnal type and ranges: DC, AC, process, thermocouple, RTD, thermistor, resistance, potentiometer, Universal 18-265 Vac/dc power. The M-35 Microminiature process meter is powered by isolated 10-30 Vdc power for 4-20 mA, 0-10 mA, 0-2V, 1-5V, or 0-10V process signals. Laureate counter / timers are applicable to a wide range of applications with pulse or AC signals. They offer exceptional accuracy with a 6-digit display at high update rates. Hardware options (all isolated) include relays for alarm or control, analog outputs, and serial communications (Ethernet, USB, RS485, RS232). The Modbus protocol is fully supported. A frequency signal conditioner board accepts two signals from 0 Hz to 1 MHz at signal levels from 12 mV to 250 Vac. Applications include rate, frequency & period, totalizing, process timing, batch control, phase angle and power factor, and duty cycle. The two channels can be combined arithmetically, for instance to display the sum, difference or ratio of two flow rates or two totalized flows. A voltage-to-frequency signal conditioner board converts analog signals to a frequency, thereby converting the counter into a very accurate process meter and process signal totalizer. A quadrature signal conditioner board accepts A and B encoder signals for accurate display of quadrature rate or position. Laureate LT Series RS232/RS485 & 4-20 mA transmitters provide an isolated, digitally addressable serial data output, an isolated 16-bit, 4-20 mA, 0-20 mA or 0-10V analog output, plus dual solid state AC/DC relays. The Modbus protocol is fully supported. Laureate LTE Series Ethernet & 4-20 mA transmitters can be interfaced to an Ethernet network while also providing an isolated 16-bit, 4-20 mA, 0-20 mA or 0-10V analog output plus dual solid state AC/DC relays. The Modbus TCP protocol is fully supported. Laureate LTS RS232/RS485 input transmitters and LTSE Ethernet input transmitters are serial-to-analog converters which convert serial data to an isolated, 16-bit, 4-20 mA, 0-20 mA or 0-10V analog output. These converters can extract readings from long data strings. Inputs for LT and LTE Series transmitters can be analog signals (AC voltage or current, DC voltage or current, strain gauge, load cell, thermocouple, RTD, resistance), pulse inputs (rate & frequency, totalizing, quadrature position or rate, process time, sum, difference or ratio of two inputs, AC phase angle or power factor, duty cycle), or a serial data (RS232 or RS485) input. Our MAGNA Series large digit displays come in four digit heights: 57 mm (2-1/4"), 102 mm (4.0"), 150 mm (5.9"), and 200 mm (7.9") for long viewing distances. They are available for the following signal types: serial data input, process signals (e.g., 4-20 mA), strain gauge / load cell input, frequency / rate input, quadrature position, clock or timer. Our Laureate 6-digit serial input meter can display Ethernet, USB, RS485 or RS232 data from PLCs, computers, instruments or smart sensors. It can also convert this data to one or two analog outputs to serve as an isolated current transmitter. Optional relays can respond to the transmitted readings or to control characters. Laureate digital panel meters, counters, and timers offer RS232, RS485, USB or Ethernet data I/O as an option. The LNET485 board interfaces an Ethernet link to a mix of up to 31 Laureate meters and transmiters which are multi-dropped on a half-duplex or full-duplex RS485 bus. Laureate LT series transmitters come standard with an RS232-RS485 serial port, while LTE series transmitters come with standard with an Ethernet port. An isolated 4-20 mA analog output is also standard for output to a PC or PLC. Discovery and configuration of Laureate Ethernet nodes and their connected devices acn be via Windows based Node Manager Software, or via a Webserver Mode which uses a website resident each node.